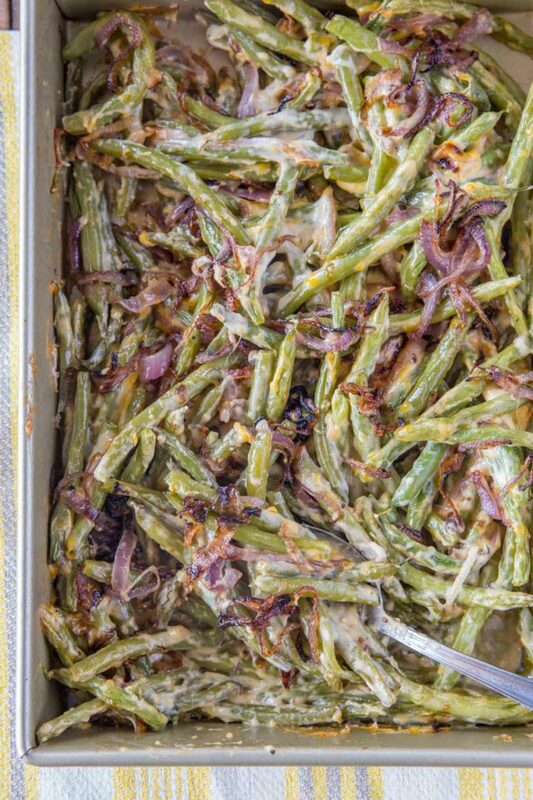 Healthy Green Bean Casserole made with fresh green beans, a lightened up cream sauce and caramelized red onions. We are huge fans of green bean casserole (in fact I posted a Classic Green Bean Casserole on Dinner, then Dessert today!) As much as I tried to figure out a way to keep the crispy onion topping, I just couldn’t do it without making this side dish less healthy than I was comfortable with. Given all the other delicious foods you are going to be eating I figured loosing the crunchy onions meant a slice of dessert or possibly some scalloped potatoes. Now lets talk about the delicious cream sauce in this recipe. I start with red onions and mushrooms as a base for the flavor since we are skipping the cream of mushroom soup altogether. This gives us a huge amount of flavor to work with. Adding in the sharp cheddar cheese brings in a ton of flavor too without the added points because we’re using 50% reduced fat. The sharp cheddar may be a bit tough to find in a classic grocery store, I purchased mine at Trader Joe’s. In fact there is even a Cabot Cheese version of the reduced fat cheddar that is 75% lower in fat that I love too, but I didn’t use it in my recipe as it may be even more difficult to find than the 50% reduced fat version. 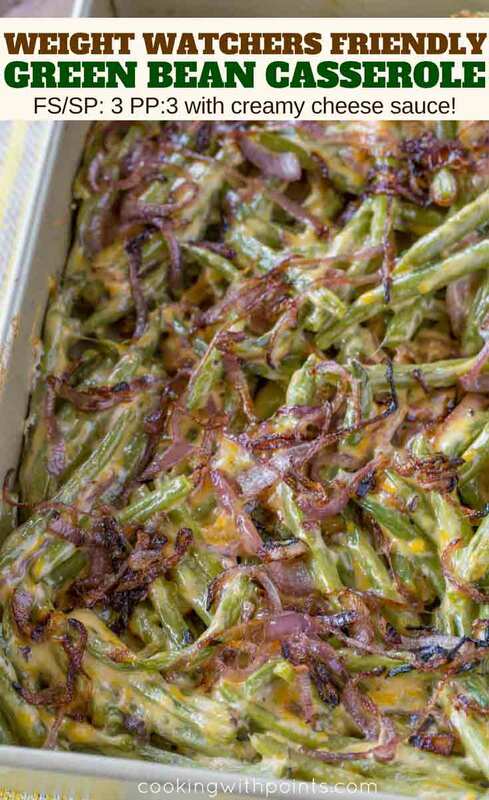 We roast the green beans first in this recipe. This is because we want the green beans to get tender, but we don’t want the cheese sauce to reduce too much in the oven. If you were to toss the sauce with uncooked green beans and bake them, you’d end up with an incredibly dry dish. Green bean casserole is classically a saucy dish, so let’s protect our sauce (since that is where a lot of our points come in) and roast those green beans first. When it comes to making a cheesy cream sauce, there is a certain amount of oil needed (we use 1 tablespoon) with a bit of flour to start the roux. This is necessary and shouldn’t be skipped. Remember we are cooking for 8 servings here, so a small amount of oil won’t hurt. Then we use 2% milk, I wouldn’t go lower than 2% and expect a good creamy sauce, it would just be too watery. You need the fat to help emulsify the sauce. Why Use Sharper Cheeses in Low-fat Cooking? Using sharp cheddar cheese is an intentional choice. I used to watch a healthy cooking chef on Food Network who would always say, when using cheese go for the boldest flavors, so you can use less. Using a mild cheese here would be wasting the opportunity for more flavors, so I tend to stick to stronger flavored cheese in light cooking. Toss the green beans with the olive oil and roast for 20-25 minutes. Lower the heat to 350 degrees. Add the second tablespoon of olive oil to the pan and cook the red onions until caramelized on medium high heat, about 5-7 minutes. Remove the onions and add in the mushrooms cooking them until they're caramelized, 5-7 minutes. Add in the flour, salt and pepper and half the red onions whisking well, cooking for 30 seconds. Add in the milk and whisk well, letting it cook for 3-4 minutes or until thick enough to coat a spoon. Toss the green beans with the sauce and cheese and place into a baking pan. Top with the remaining red green beans and bake for an additional 10 minutes, or until the cheese is melted and bubbly. 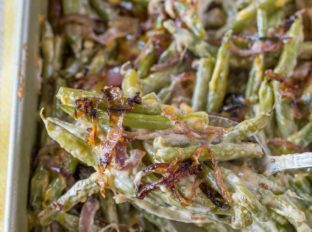 Green bean casserole is one of my absolute favorite side dishes, and this healthier version is genius! Wow! Such a great recipe! Perfect! 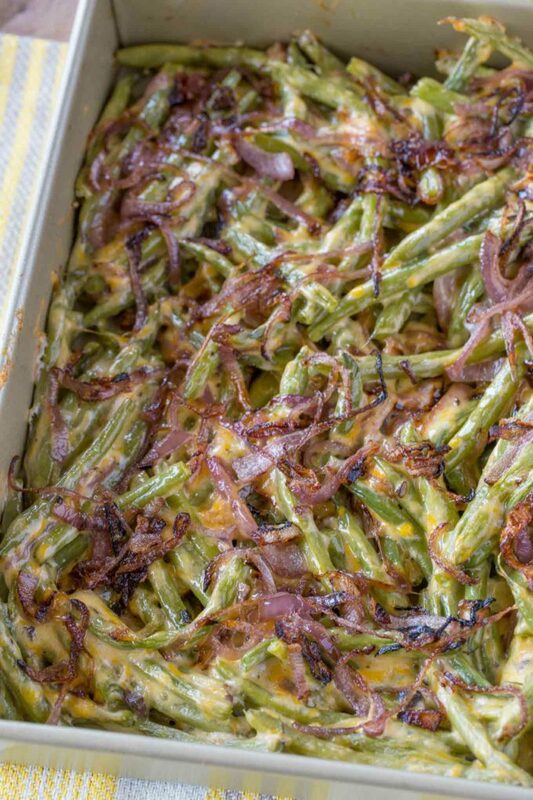 Green bean casserole has always been a favorite recipe of mine! 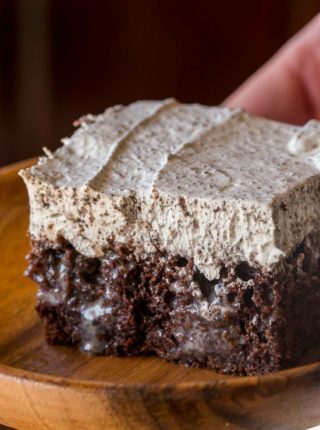 Love how you made this healthier version! Can’t wait to try it. Thanks, Megan! Hope you like my version as much as the classic! YES! I love this healthier version of a classic! What a fantastic low cal version!! Yum! 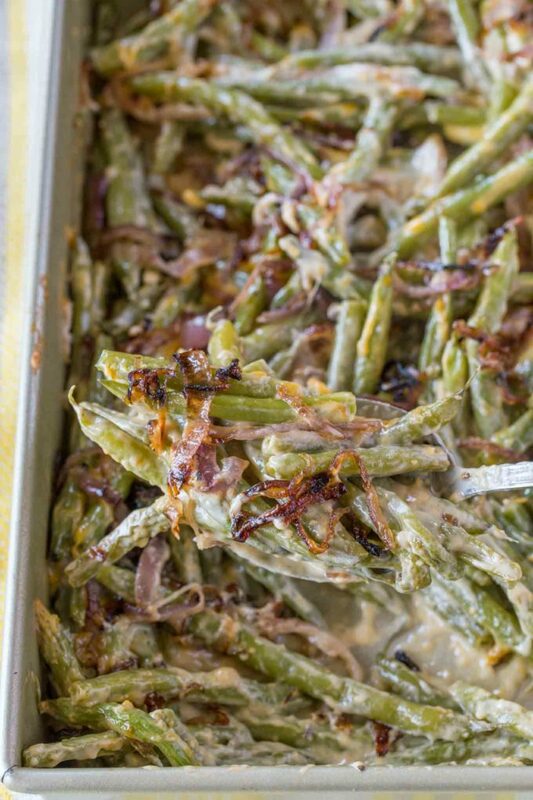 This is one of the best green bean casseroles I’ve made! I also only had So Delicious Unsweetened Coconut Milk to use and by increasing the boiling time, was able to get a great cream sauce – and did not taste like coconut with how long the mushrooms, onions and milk cooked together. Soooo good! Will be making this again. So glad you enjoyed the recipe, Chelsea!